Jim Grote, Founder of Donatos Pizza and Founder of the J.E. Grote Company speaks in TechColumbus Leadership Series. This post is the companion to a Voice America interview with Tracy Wilen, researcher and speaker on the impact of technology on society, work, and careers on VoiceAmerica “Innovative Leaders Driving Thriving Organizations” Digital Disruption: The future of Work, Skills and Leadership airing on April 17, 2018.
continuing accelerated pace of technology and competitive forces is causing workplace environments to become more technical, diverse, and in need of leaders who understand how to deal with disruption. 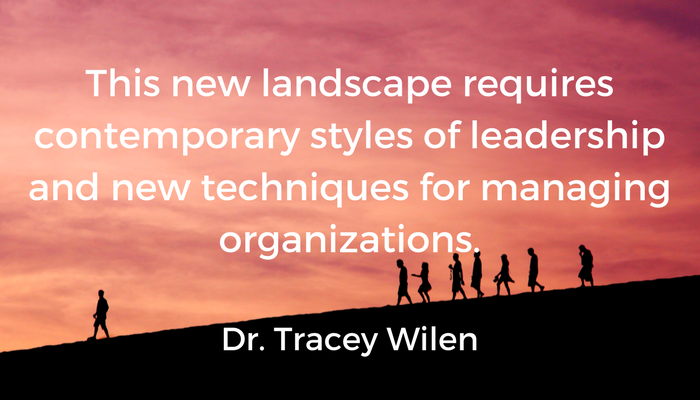 This new landscape requires contemporary styles of leadership and new techniques for managing organizations. 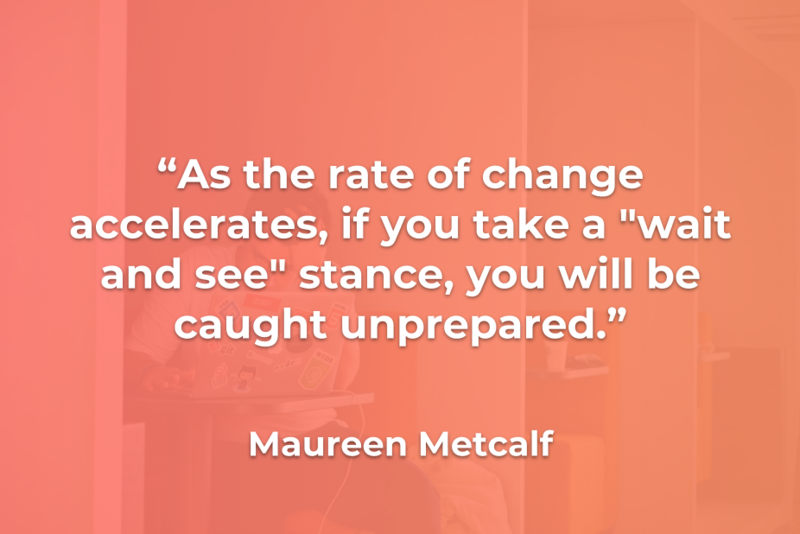 Today, there are unique pressures on company leaders, workers, and educators to change the ways they prepare and plan for modern-day jobs and careers. This interview and Tracey’s book, Digital Disruption: The Future of Work, Skills, Leadership, Education and Careers in a Digital World, offer educators, executives, and students a fresh approach for how to navigate the future to ensure success. They cover the key forces impacting the future of work, industries, leadership styles, skills, and education with a focus on how to remain relevant in an ever-increasingly complex digital world. Here are the 10 disruptive predictions for 2018. Disrupted Society. Society is hyper‐connected, dependent and, in some cases, addicted to continuously being “connected.” And the expectation is that this will be increasingly the case. If you sleep with your phone, panic if it is missing, text numerous times a day, have numerous apps you use daily, frequently post selfies on social media, and buy most items on‐line, and are an Amazon prime member, it is a seamless part of your life. This is you. Disrupted Work. There are many shifts in the work place. One is extreme longevity, meaning many people will work 60 years to afford to retire. 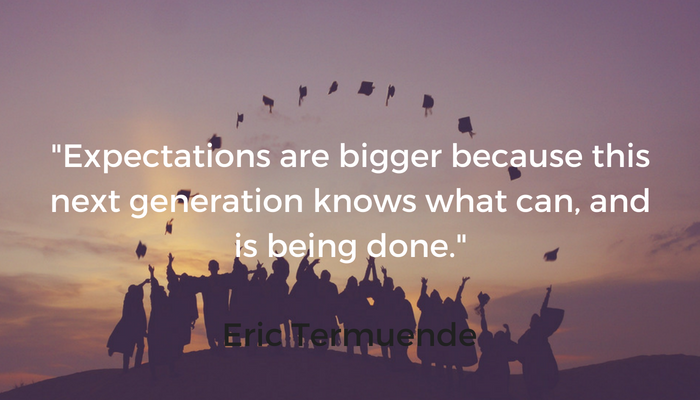 This also means a multi‐generational workforce. How we work together will need to change, in addition to how many years we work. Disrupted industry. We often hear about Uber, Air BNB and Amazon. Traditional industries are being disrupted at an accelerated rate. It is imperative that leaders pay attention to not only their industry but also those tangentially connected to monitor trends—and anticipate the impacts they will have on you. 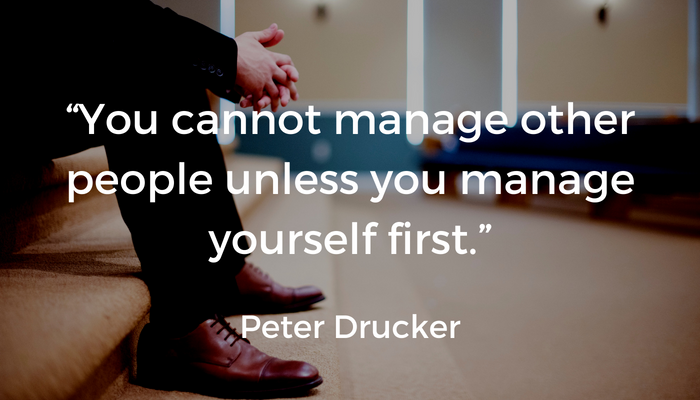 Disruptive Leadership. If work and industry are disrupted, do we need disruptive leaders? To compete, leadership needs to change because a VUCA (Volatile, Uncertain, Complex and Ambiguous) world requires new kinds of leaders. Women as disruptive leaders. Women are Corporate America’s killer app. Women are skilled, educated, have modern-day leadership skills, collaborate, trust, see the big picture, promote employee engagement, and have in-demand skills. Disruptive Diversity. Diversity is strategic for disruption. Innovation and diversity go hand-in- hand invest in 2018. Delivering products and services to a diverse customer base means having a diverse design team and workforce. Disrupted Careers. With all the changes to work and industry, jobs will most certainly change. It is important to keep current with technology, make lateral moves and continually build skills. Disruptive skills. Everyone will need additional and new skills, for some people, Social Intelligence will need to increase, in a digital world. Do you see how you are perceived as a leader or team mate? Can you read the room and get a feel for what people think of you? Others will need to increase their ability to make sense of the increasing volume of data and turn the insights into action. Disrupted Education. Education must supply the world with capable people who can work, think and be relevant in the digital world they will work in. Integrated work and learning strategies is a path many colleges are taking with employer Internships, apprenticeships, job shadowing, and summer jobs. Disrupted selves. Are you taking time for a “career selfie”? Have you mapped out your career trajectory? 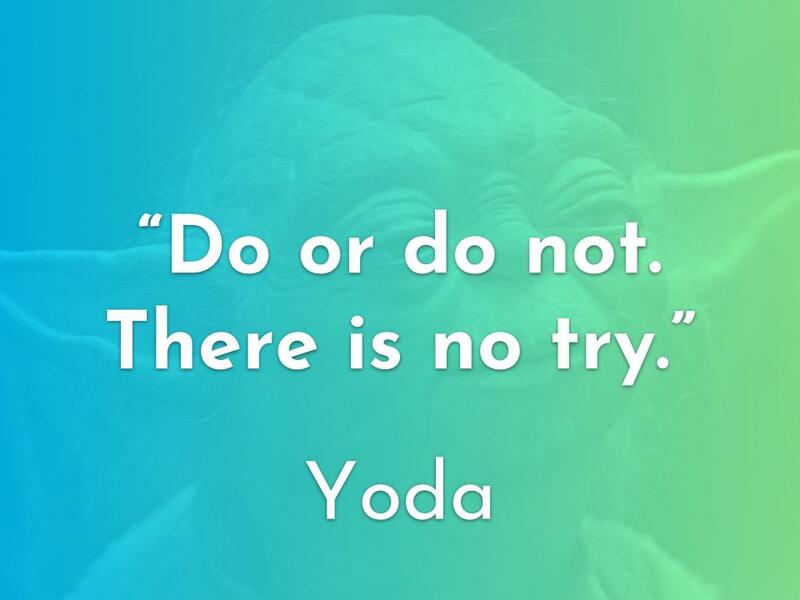 Do you collect data and review your progress on a regular basis? If not, you are likely to be missing opportunities to make the series of small changes that will keep you current and relevant. Disruption is on top of everyone’s mind. As technology rapidly accelerates, so does fear of the future. People are worrying about the impact of future technologies on our lives, how we lead firms in the digital era, our personal careers, and future jobs. Some people are tackling this head on and some are somewhat resistant or frozen in their track because the newness and pace of change. What are you doing in each of these areas to ensure you manage the disruption rather than being disrupted? Dr. Tracey Wilen is a researcher and speaker on the impact of technology on society, work, leadership, education, and careers. A former visiting scholar at Stanford University, she has held leadership positions at Apple, HP, and Cisco Systems. She was an adjunct professor at several Bay Area colleges, teaching classes in business, technology, and women’s workforce topics. Dr. Wilen has authored or co-authored twelve books including Employed for Life (2014), Women Lead (2013) and Society 3.0 (2012). She has appeared on CNN, Fox, and CBS News and is a regular guest on radio and TV shows across the US as an expert contributor. Dr. Wilen was honored by the San Francisco Business Times as the Most Influential Woman in Bay Area Business. This post is the companion to a Voice America interview with Karen Sands, Leading GeroFuturistSM, Amazon #1 Best-Seller Author, Fire Cracker Speaker, All-Around Game Changer and Thought Leader on the Longevity Economy aired on VoiceAmerica “Innovative Leaders Driving Thriving Organizations” Navigating the Graying Demographic: Rock Your Age and Manage Intergenerationally. We will continue this conversation with both Karen Sands and Virginia Macali in future conversations. I often talk about the changes in technology and how they will change our work lives. For readers who are around fifty years of age, if you make it to sixty-seven, you are likely to live into your mid-80s. This is particularly interesting because I am in my 50s and wonder for myself what my next twenty years will look like if I live another thirty years. In talking about personal choices, I also examine the trends regarding baby boomer retirement and levels of unemployment. Add to that, the unemployment rate for 2018 is expected to be 3.9 percent according to The Balance. Artificial intelligence and technology will change the composition of jobs—in many cases requiring more tech savvy roles to manage the automation of prior manual jobs. In other cases, AI will eliminate jobs that focus on routine tasks. 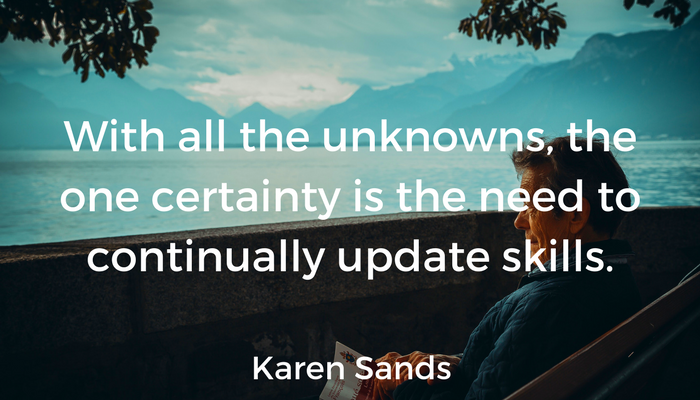 With all the unknowns, the one certainty is the need to continually update skills. I spoke with the President of Junior Achievement of Central Ohio, Mike Davis, about this trend. According to Mike, his focus after reaching age fifty has been to continually update his skills to stay relevant and move his organization ahead and leveraging the changes in our ecosystem to make the greatest impact. What do I value and how do I find meaning in my life? Specifically, how do I continue to find meaning in my life and work? 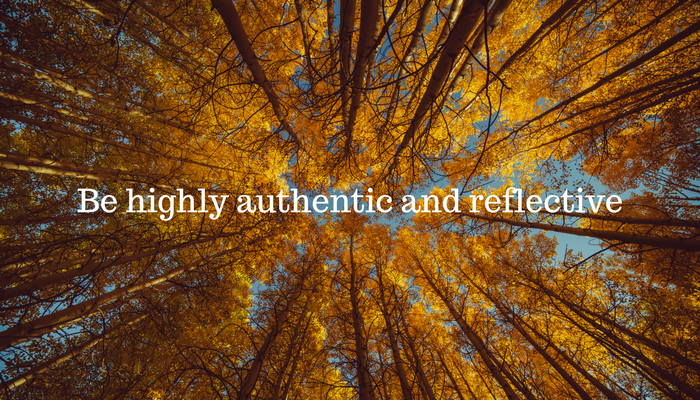 Personally, I find a great deal of fulfillment in my professional work both within my company, teaching in universities, and in board work. I hope to continue to participate in each of these roles over the next 20 years. What do I do with my time? 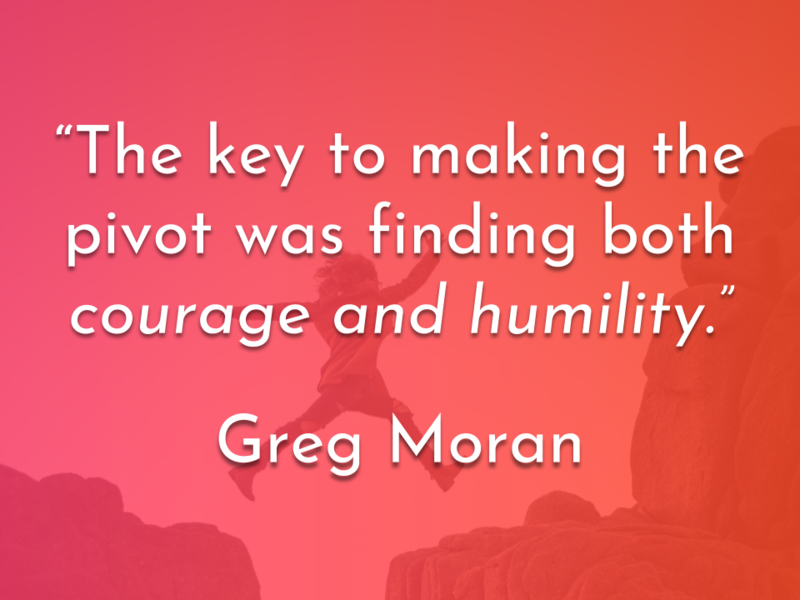 If I value the work and my sense of purpose based on the work, I need to maintain my level of knowledge and continue to grow, especially since my personal brand is associated with innovating how we lead. To be true to what I say I do, I will need to continue to invest significant time in learning. I will also need to explore working alternatives, particularly when traveling, that match my energy level. This will mean leveraging technology to manage whenever possible. What do organizational cultures support? It seems that many organizations are open to older workers as long as they are able to keep up with younger workers. I plan to promote environments that build productive interactions across age groups. This could be co-mentoring or other structures that allow multiple age groups to support one another’s growth and development. What do organizational systems support? Organizations need to promote ongoing education to ensure their workers can continue to perform their roles at ever increasing levels over time. As workers plan to retire later, it is incumbent on both the employees and the organizations to update skills, so the work is performed to necessary standards. An opportunity for companies who can be creative is to promote flexible working arrangements for older workers who no longer want to work a standard 40+ hour schedule. 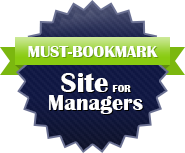 This could include working remotely, job sharing, or working on a task-related basis like “gig” workers. What stands out for me as I consider my own future, is that I must maintain my current level of impact in the world, which is where I find great meaning and value in my life. I need to continue to invest in my own skill development. I also need to stay healthy. While we haven’t discussed this element, it is imperative for me to attend to my health and manage my stress so I am able to continue working at a high level of performance. This blog is a guest post and companion to the Voice America Interview on “Innovative Leaders Driving Thriving Organizations” with Christopher Cooke and Sheila Cooke on October 17, 2017, Navigating the holistic Worldview Membrane. The Netflix series, “Designated Survivor”, offers a refreshing story about a president who is able to manage incredibly difficult circumstances. In the TV series, low-level cabinet member Tom Kirkman unexpectedly becomes president after a devastating attack on Washington, D.C. He gets in by emergency protocol because he was named “designated survivor”. In the conspiracy, his forced selection is intended to lead to social failure, making way for dictatorial takeover. Yet against all odds, he and his administration lead with aplomb. Why? Because his thinking is different – he values civility and all life. He envisions novel solutions that work. He engenders flexible and creative thinking in others. He is unafraid of disturbing the status quo. Yes, it is fiction, but the fact that a TV scriptwriter could conjure this story tells us a new way of thinking is emergent and ready for prime time. What’s really going on in this TV series? It’s about the emergence of our species. Humans are continuously co-evolving with their life conditions. As the world complexifies, new capacities emerge, or not. This is what we define as human emergence. Today’s life conditions are testing the limits of the adaptive capacities of all life forms, not just human. Earth is fragile. Society is fragile. Threats of nuclear war, the ever-widening income gap, and the sixth mass extinction challenge every basic assumption. 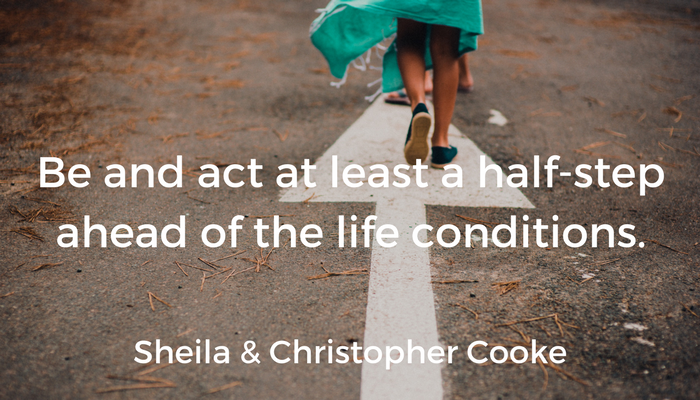 Be and act at least a half-step ahead of the life conditions. “A half-step ahead” refers to the capacity to look back in from the balcony to discern what’s really going on, to flexibly morph and fit oneself to the circumstances, to lead from a strong sense of purpose that is aligned with all life. Such an individual can suss out trouble, navigate obstacles, and make quality decisions that impact positively on all life. As long as old ways of thinking remain entrenched, latent complexity-aware capacities are unable to be released within an individual or society. Simply becoming aware that our development is not yet finished, and that more is possible, stimulates the legitimacy and utilisation of new ways and means. How can one support one’s own emergence, or that of another? It is possible to learn how to stimulate human emergence by using research instruments, such as those offered by 5 Deep Vital Signs. These instruments hold a mirror up to the individual or to the organisation, to reveal patterns of thinking that cannot be discovered through self-examination. The next big wave of human emergence can only happen volitionally. In other words, we need to wilfully seek it. It is like deliberately rubbing your own magic lamp to call out your inner genie, the hidden treasure inside. Christopher Cooke: (MSc. B.A. FellowRSA) Is the founder and a lead consultant for 5 deep. He is an international senior manager, consultant, coach, confidante, counsellor, therapist, trainer and qualified engineer, with over 28 years’ experience in pioneering and supporting personal and organizational change. He is focused on the release of latent human capacities to navigate gracefully through complexity, innovation and change. Christopher has become a leading figure in the practical demonstration of The Graves Technology, Spiral Dynamics, and Integral Theory since 1997. His commitment and focus has seen application in as many contexts as possible. Sheila Cooke (MBA, B.A.) is a Director and lead consultant for 5 Deep. With over 20 years experience in leading international business, Sheila specializes as a designer and trainer of virtual and face-to-face collaboration processes that build resilience and adaptability within organizations to lead through complexity, by building capacity for self-organization. She leads Land and Livestock Management for Life (an operating division within 5Deep) which is part of the Savory Institute Network. Check out the following link CLICK HERE to learn about the current virtual training offerings and products from 5 Deep. Top Skills to Lead For the Future! 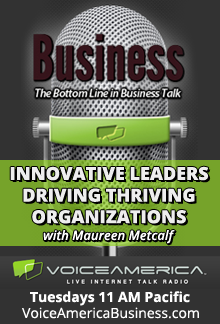 This post is a companion to the interview with Mike Sayre, President and Chief Operating Officer of Metcalf & Associates on VoiceAmerica “Innovative Leaders Driving Thriving Organizations” on May 16, 2017: Seven Characteristics of Leadership 2020: A CEO Story. An abbreviated version of this post appeared in Columbus CEO on January 25, Preparing Aspiring Leaders for Key Roles. 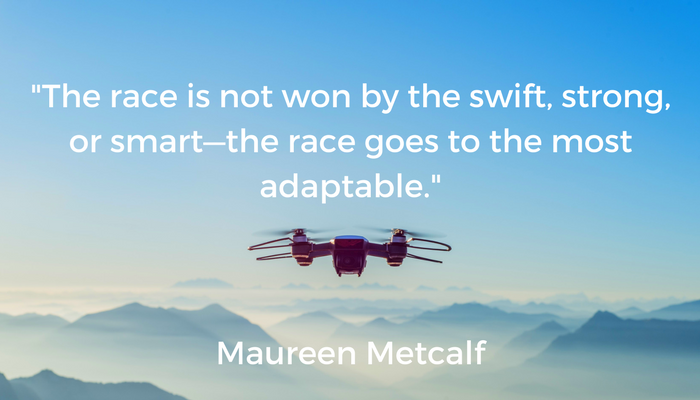 The following article is an article published in Forbes March 2017.
https://www.innovativeleadershipinstitute.com/wp-content/uploads/2018/02/Be-highly-authentic-and-reflective.png 400 700 Maureen Metcalf https://www.innovativeleadershipinstitute.com/wp-content/uploads/2018/10/logo.png Maureen Metcalf2018-02-06 10:56:452018-05-01 16:36:36Top Skills to Lead For the Future!